With Walmart ending price matching, first at 500 stores, then at an additional 300 stores, it’s time we all prepared for the worst. I wasn’t worried when the initial 500 stores stopped but once they expanded the test to another 300, I think that means they like what they saw with the first 500 and wanted to expand it. There are all kinds of rumors flying around that Walmart will end price matching company wide by the end of the year but so far those are just rumors. So perhaps you don’t have ad matching anymore or maybe you found this post in the future when price matching has ended company-wide and are looking for some pointers on what to do next. Hopefully you will find some helpful advice here. It’s worth noting before we start that the reason Walmart is ending ad matching is to be able to focus on undercutting their competitors on price directly without having to use ad matching and from what I’ve seen so far, they are actually doing that. If they continue on this path, we may not end up missing as matching at all. I’ll be honest, 90+% of my shopping will continue to be at Walmart but if the Kroger has a great deal on pork chops one week, I’m going there. I wouldn’t stop flipping through the ads every week and taking advantage of any loss-leaders at competing stores. This probably goes without saying if you are a regular reader of this blog but those coupons are going to be even more important moving forward. Don’t stop getting your Sunday papers and printing those coupons. It looks like even if price matching ends, the Savings Catcher program will continue. If you don’t know what it is, it is built into the Walmart app or you can access it through a browser here. All you do is once you check out at the register, you scan the QR code at the bottom of your receipt with the Walmart app and Savings Catcher will compare what you bought with the sales of the local competitors. If someone has something on sale for less than what you paid at Walmart, you get the difference back in a Walmart eGiftcard. If this is really the end of ad matching, I know I’ll miss it but there will always be ways to find great deals and the Grocery Shop for FREE team will be here to share them with you! Join Us on Blab as We Discuss How to Create a Price Matched Shopping List! Come join us on Blab.im in a few minutes as we talk about how to create a price matched shopping list! 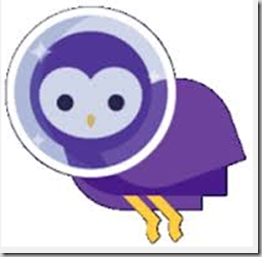 Be sure to follow me on Blab also as we will be teaching you how to save money every week on this new channel! We’ve talked in the past about How to Deal with Rude Cashiers at Walmart but we’ve never really discussed how to deal with incompetent or poorly trained associates. 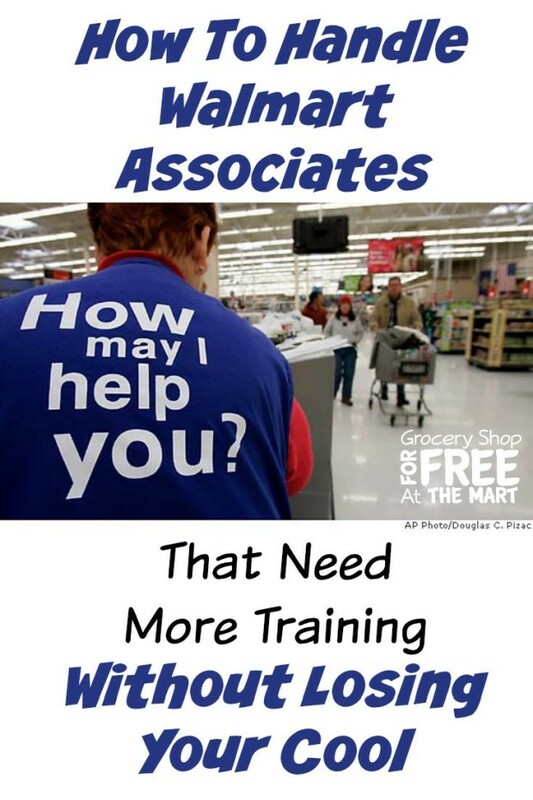 My son’s girlfriend recently started working for Walmart so I got a little insight into how they are trained on policies and was surprised that so little time was spent training associates on coupon and price matching policies. In fact she told us that the only training she go was when she was on the register. Every time she encountered something new, she called for a CSM and they walked her through how to handle the situation. No wonder we run into cashiers that don’t seem to know a coupon from a hole in the ground so often! I did a little research and saw that while Amazon was charging $35, Walmart.com had it for just $29.49. (Looks like those prices have changed a bit but that’s what it was when I bought them.) I could have bought it online at Walmart.com but I knew I was going up to my store a bit later so I’d just pick it up off the shelf and price match it. So I went to the store, picked up my groceries and headed to Electronics to get my Chromecast where I saw the shelf price was $35. No biggie, I knew I could change the price at the register so I headed to the front to check out. I had a few ad matches and a few coupons for my groceries and that all went well but when I told the cashier my Chromecast was cheaper on Walmart.com, she informed me that this particular store doesn’t match online prices. Hmmm…that’s clearly not right but I assumed it was just another poorly trained associate so I politely asked her to call the CSM over and ask her about my price match and in the meantime, I pulled up the Walmart Online Price Matching Policy on my phone just in case. By this time the CSM came over and I explained what was going on to her and to my utter astonishment, she told me the same thing the cashier told me. She that the Store Manager has told all associates that they don’t match online prices and she wasn’t interested in reading the policy I had on my phone either. I pointed out how nuts they were being considering I could buy it on my phone and choose the Pick Up in Store option and go to the back desk and pick it up there for the price I wanted but all to no avail. I knew my next stop would probably be to call 800-WALMART and explain what was going on to them and I knew that if I did that, I was getting my Chromecast for $29.49 but before I pushed it that far I wanted to see if I could at least talk to the store manager and see if he was actually refusing to follow the written store policies. I asked if he was available and by some Walmart Miracle he was working on a little display not 10 feet from where this little drama was going on. Lucky me! I walked over to the Manager and told him what happened and emphasized that 2 of his employees just told me that HE was the one that told them not to do Online Price Matching. His reaction was exactly what it should have been. He said that his store follows ALL the official Walmart policies and even if he did have an issue with it, he certainly wouldn’t be arguing about a $5 change in price. Finally someone with some sanity! He asked me who told me these things and then he instructed a different cashier to check me out so hopefully some On The Job Training took place after I walked away. Stay Calm – You will always catch more flies with honey than vinegar. Know Your Policies – Smartphones are awesome for this. Ask for the Manager – Just keep going right up the line until you find someone who knows how to do their job. Call Corporate – If all else fails, call the Home Office at 800-WALMART. They will almost always tell the manager to follow the written guidelines. Hopefully you will never be in a situation where you have to go through this but if you ever are, remember those 4 steps and save your money! 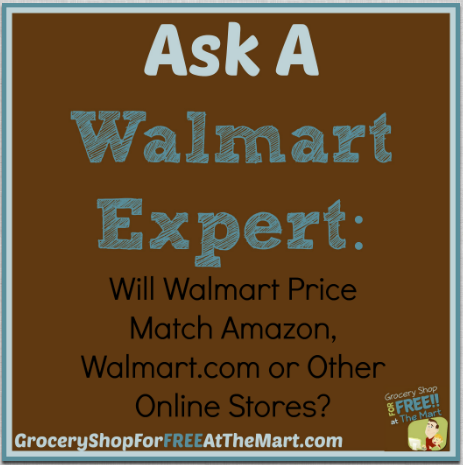 Here’s another entry in our Ask A Walmart Expert series. 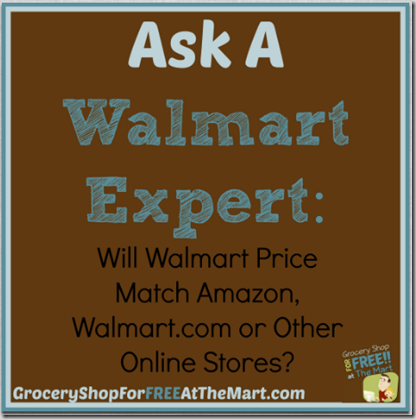 Will Walmart Price Match Amazon, Walmart.com or Other Online Stores? UPDATE: Almost everything in this post is changing. There is a new Beta program where Walmart’s in some areas WILL price match online retailers. Details are scarce but you can read about what we know here. 2nd Update: Everything in this post is now wrong. Walmart will now price match almost any online retailer. The details are here and a short video showing how to do the price matching is here. Walmart will not ad match any online price if it is only available online. (like Amazon) If an item is also sold at a local brick and mortar store and is featured in their weekly ad, then they will gladly do it. One big thing to keep in mind is it has to be exactly the same item for Walmart to match and on big ticket electronics items, Walmart will frequently change the model number to a Walmart-specific number (Usually by adding WM to the end) so it cannot be price matched from anywhere. 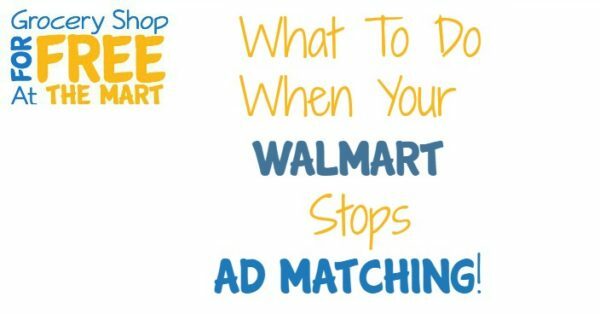 You might think it a little odd that your local Walmart won’t even price match Walmart.com but that is the rule so don’t expect them to do it. Walmart considers Walmart.com and totally separate entity from their brick-and-mortar stores. On a totally unrelated note, my son wanted some fancy headphones and a large micro SD card for his new phone so he asked me to take him to Best Buy. As he was picking out his headphones, I scanned the barcode and looked at the price on Amazon.com and they were significantly cheaper. As I was trying to convince my son to just go home and let me order them an employee came over and told us that Best Buy WILL match Amazon. My son saved over $70 on both the headphones and the micro SD card. I was a happy camper! UPDATE: Any time you write something about Walmart’s policies it needs to be pointed out that there is a difference between the official corporate policy and what actually happens in your store. Walmart policy enforcement is like something out of the Wild West with nearly everything being up to the Store Manager’s approval. In other words, if you would like to price match something, ask. Chances are you will be told no, (as you should be) but every once in a while you can find a Manager in a good mood and get what you want. I personally have NEVER seen it happen and I have only heard of one reader (who works at a Walmart, read the comments) tell me their store does it. It’s happened to all of us. You are in line, minding your own business, ready to check out and BAM! Out of nowhere you are hit with a rude cashier at Walmart. That cashier that thinks that using a coupon means you are stealing from the company. That cashier that thinks price matches come directly out of their paycheck. That cashier that has spent far too long on their feet and just can’t deal with another customer. What do you do? We know what you WANT to do. Just drop the gloves and give that cashier a piece of your mind! I know that feeling but I also know it’s counter-productive. 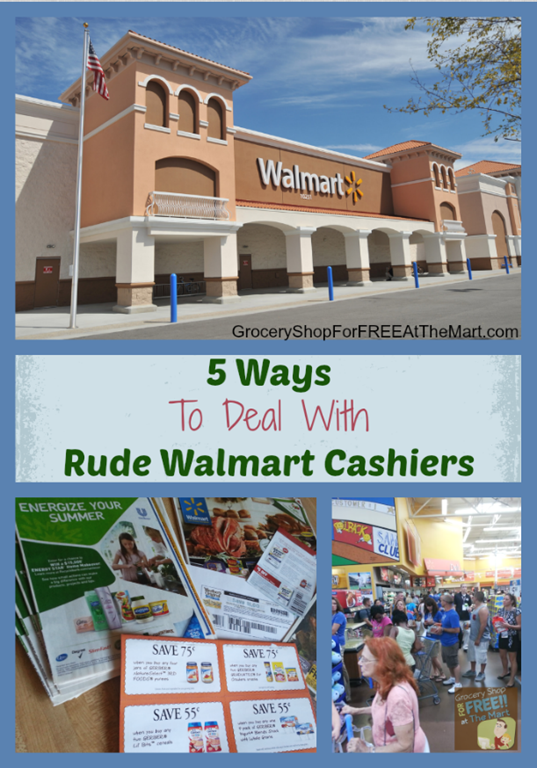 Fortunately, because of this blog I have become an expert in dealing with rude cashiers. Many times I have had readers contact me with stories about something that happened and I have felt obligated to step in and try to get it resolved. Here’s a helpful list of suggestions so you can handle the situation yourself. 1. Make sure it isn’t you. I know, nothing justifies a rude cashier. They are being paid to be helpful and courteous and you aren’t but face facts, if you are rude, you are probably going to get rudeness in return. Smile. Be friendly. Remember that if you are using coupons, you represent all couponers. I have heard so many horror stories from the other side, stories of awful couponers, that it makes sense that they would not want to deal with us. Make sure you know what you are doing before you get in line. Usually there is a CSM floating around that can solve most issues and most of them want to hear if an associate was rude to you. I have had several instances where problems with a cashier were solved by a CSM, sometimes they will even move me over to an empty cash lane if I have a big order and check me out themselves and deal with the cashier after I leave. Go to the Walmart website, find your store and call the store manager during normal business hours. Tell them exactly what happened and who was involved. Believe me, they WANT to know. If they have a rude associate, they want to be able to deal with it as quickly as possible. No store manager wants to his employees offending customers and he/she not knowing about it. There is no easy way to figure out who they DM is for your district except to ask at the store level for his or her phone number. If you have burned every bridge at your Walmart and don’t want to talk to them, call the next closest Walmart. Walmart’s customer service number is 800-WALMART or you can email them here. Remember to be concise and precise and know the name of your cashier. It’s never taken me more than a few hours to get a response. That should do it. I’ve never had a situation that wasn’t resolved as long as I followed the steps. It is also important to say that you should ALWAYS follow these steps with EVERY rude Walmart Associate. That employee needs to know that there are consequences for rudeness and either shape up or ship out. One other thing that should be talked about is if you have an amazing experience with a Walmart cashier, follow the same steps above to let people know. Trust me, if you spend any amount of time at a Walmart, you want the good cashiers rewarded so they stick around and the bad cashiers weeded out. That should do it! I want to hear your story. If you have had a bad experience with a Walmart Associate, please leave a comment telling what happened and how you handled it. Today is the last installment in out Learn How to Coupon series! I hope you have learned a ton and are ready to put it into action. What Do I Do With My Stockpile? Stockpiling is one of those things that people who don’t coupon really don’t understand. They see you with 40 tubes of toothpaste and they think you have a hoarding problem or are just greedy. They don’t understand that stockpiling allows you to get what you need for your family for several months at a fraction of what they will spend. They also don’t understand that when you stockpile, it allows you to bless the community outreach groups around you. My local night shelter depends on donations to continue to help the poor and homeless in our area and we are so blessed to be able to donate out of our abundance to them. Rarely a quarter goes by that we can’t give them tons of toiletries and personal care items that we paid next to nothing for. If you coupon, don’t feel guilty about getting more of an item than you can use. If it’s free or very cheap, get it and donate it! New Year’s Resolution–Learn How To Use Coupons Part One: Where Do I Find Coupons? 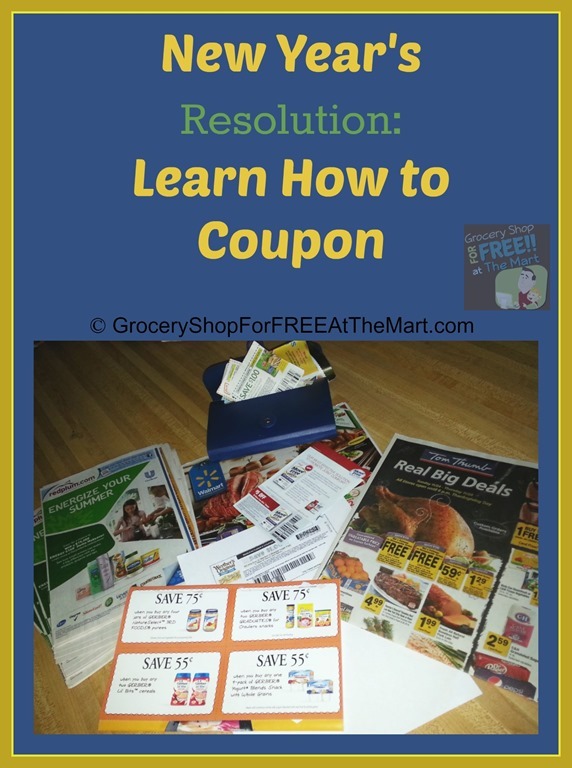 New Year’s Resolution–Learn How To Use Coupons Part Two: How Do I Organize My Coupons? Welcome back to our week-long series on Learning How to Coupon! Today we are looking at How to Stockpile. Stockpiling is really the endgame of couponing. Every experienced couponer wants to have a stockpile of 3-6 months worth of the products they use in their household that they have paid as little as possible for. What are You Brand-Loyal to? The first step to stockpiling is knowing what you are and are not brand-loyal to. For instance, if you are brand loyal to a specific brand of coffee, you want to clip every coupon for that brand and watch the sales ads for when that brand goes on sale. If you are not brand-loyal to a type of coffee, then you just want to watch for when any brand goes on sale for it’s absolute rock-bottom price and buy 3-6 months worth then. (Check expiration dates, don’t buy more than you can use before it expires or safely freeze) Repeat this for every product you use in your household. What is the Rock-Bottom Price? The easiest way to learn what the cheapest you can buy the products you use is to use a price book sheet. Print that sheet out and track your products. After a few weeks, you will have a good idea of what the sales cycle is like for that products. For instance, the first few weeks of summer is when you want to buy ice cream because everyone is trying to undercut the other stores. Blue Bell is normally $4.99 a half-gallon here but if I catch the right sale, I can get it for $2.50 a tub. As you become more experienced in couponing, this will become second nature. You will know what you buy and how much you should spend on it. Any questions about stockpiling or any part of couponing? Leave a comment or contact me and let me help! Click here for part 6. In today’s Learning How to Coupon Series we are looking at something that most couponing series don’t cover, what to do when you are ready to check out. You would think that this would be the easiest part and in a perfect world it would be but anyone that has spent any time couponing can tell you horror stories of cashiers that don’t know what to do with coupons. You would be shocked at how far a smile will take you at the register. It starts the transaction off on the right note and gets the cashier on your side. It is the easiest thing you can do to make sure your couponing trip ends well. I shop for cashiers with the same care I shop for groceries. I have been going to my store long enough to know which cashiers know what they are doing and which ones don’t. The last thing you want is to get in the line of the cashier that thinks they are on CSI: Coupons and wants to examine every word of every coupon. In the immortal words of Sweet Brown, ain’t nobody got time for that! I also try to get in a line with a few people in it because I like to organize my products on the conveyor belt before I check out to make things easier on the cashier. To see exactly how to do that, watch the video above. I also want to be the line that has other couponers/price matchers in it. Something about not being the first one makes things go easier. At the stores I shop at, all the Hispanic women shop on Wed and Thursday with the new ads and totally forget how to speak in English when they get to the register. By the time they get to me, the poor cashier is so beaten down that they aren’t interested in spending the energy necessary to look all my price matches up in their own ads and will just type in the prices I say. 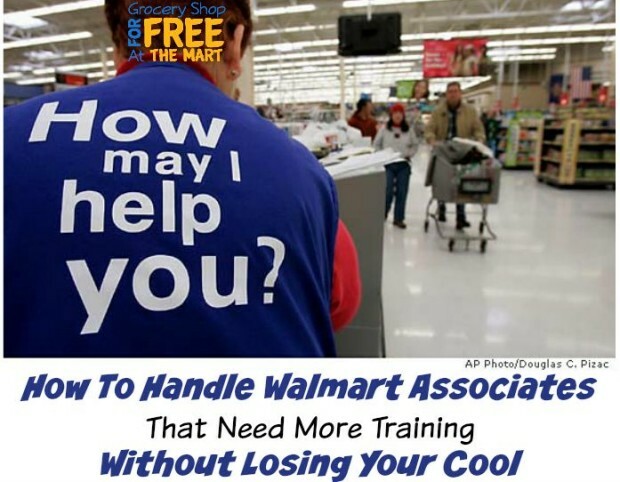 If you follow the steps above, are courteous to the Walmart Associates and work hard to make your transactions go as smoothly as possible, the associates will begin to trust that you know what you are doing. As more trust is built, the easier things go for you. 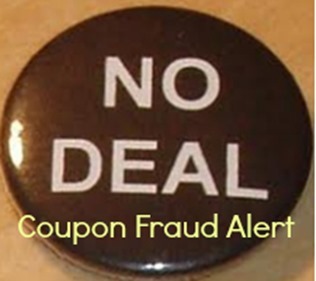 There was a story earlier this year of a man who tried to bully Walmart Associates to take his coupons and expired price matched and he ended up being banned from every Walmart in the country. That is not what you want. Any Questions? Contact me and let me help you! Click here for Part 5. We are continuing our series on Learning How to Shop with Coupons and today we are covering a crucial part of the process, planning your shopping trip. If you read any article or watch any video that covers how to save money every month, one of the first things they will tell you is to make a shopping list. This makes you less prone to impulse buying and makes sure you get everything you need so you don’t need to make a second trip. Making a plan is especially important for the couponer because it is difficult and stressful to be in the store, looking through coupons and ads, trying to find out what the best deals are. You want to walk in knowing what you are buying and what coupons you will be using. How Do I Plan my Shopping Trip? If you are new to couponing, the first thing you need to do is familiarize yourself with Walmart’s coupon policies and Price Match policies. I’ve linked you to the relevant info for your convenience. After that, it’s just a matter of finding out who has what on sale and what coupons are available. I have price match lists that I put together each week that makes it easy and I go through the process in the video above. Once you find out what’s on sale, then use the Coupon Database to find the coupons you need. Is it time-consuming? At first, yes. In fact when I teach classes I don’t make them do all this the first few weeks, all I do is make them use one coupon and price match one item the first week then move up to 5 each the second week. It can be a little intimidating when you first start out but after about 4 weeks it becomes second nature. You will always have an eye out for good deals and your Sunday Paper will become your best friend. The key is to stick with it. Is your New Years Resolution to learn how to save money? One of the easiest ways to do that is to learn how to use coupons and price match at Walmart. This is part 2 of our 6 part series teaching you how to use coupons and save money every week on your grocery bill. Today we are looking at what is arguably the most important aspect of couponing, keeping your coupons organized. How do I Keep My Coupons Organized? The best way to organize your coupons is the method that works for you. Some people like to use binders and keep them in the car. Some people like to just take loose coupon inserts in to the store with them every time the go. If I had to use either one of those methods, I would go crazy! This is the way that works for me but please feel free to adjust it as needed. As I get new coupons each week, I look through the coupons and cut out the ones I know I’m going to use. For instance, my wife like Starbucks ground coffee and Torani syrup. If either of those products have coupons out that week, I go ahead and cut them out and put them in my little coupon wallet because I know that eventually I will use them. Then I put the rest of the coupons in a folder and file them away in my filing cabinet. That way, I can find them easily if something goes on sale in a few weeks and I need to find a particular coupon. This makes every coupon very easy to find at a moment’s notice. Once I cut the coupons I need each week (Or print them out if they are online coupons) I have a coupon wallet I put them in. The wallet is organized by store section so I can the coupons I need for each part of the store I am in. The key here is you don’t want to be standing in the middle of Walmart flipping through hundreds of coupons looking for the ones you want. You want everything to go smooth and easy. Did I forget something? Do you have a question? Leave it in the comments and click here for part 3. Every year when the New Year starts, we get flooded with new readers that want to learn how to use coupons and I thought it would be good to try to provide everything the new couponer needs to know in a few short videos. If you have any questions, just leave them in the comments and I’ll answer them as quickly as possible. I have a list of places that you can print coupons here. If you are looking for a coupon for a specific product, you can search the coupon database or look on that product’s website or FaceBook page. I don’t talk about digital coupon sites like CellFire very much because Walmart doesn’t accept them but you can download coupons to your phone with programs like that. Also, some stores that have loyalty cards will allow you to download coupons to your loyalty card through their website. For example, for the last few months Kroger has had a digital coupon for a FREE product you can put on your Kroger Rewards Card every Friday. You can also use programs like Ibotta and get rebates on what you buy. Ibotta CAN be used at Walmart so I recommend you download it and stay aware of the deals on it. Did I forget something? Do you have a question? Leave it in the comments and click here for part 2.